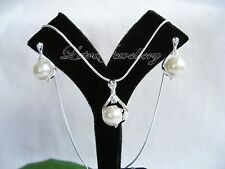 Freshwater Pearl and Agate Necklace, bracelet and earring set , Presented in box. Gold plated fasteners. Never worn . 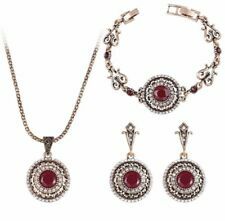 18k Gold Plated Retro Rajistan Style Necklace and Earring Sets. Condition is brand new,2 colours available red and green,please ask for choice of colour.Dispatched with Royal Mail 1st Class Large Letter. Semi-precious midnight black onyx. Gem Type: Onyx. Main Gem Size Gem Colour: black. Main Gem Shape Total Gem Weight. New ⭐️ 18ct Gold Plated Cubic Zirconia Necklace & Earrings Set Gift Box. “Cubic zirconia (CZ ) is the cubic crystalline form ofzirconium dioxide (ZrO. Matching gold plated stud earrings. The crystals are cut to round ‘brilliant’ facets to sparkle like diamonds ). This necklace is made with genuine faceted carnelian rounds (approx 6mm), peach pearls (approx 2-3mm), and a carnelian un faceted heart stone. Can be supplied with gift box if required. SET COMPRISING OF NECKLACE MATCHING BRACELET. EARRINGS AND FREE SIZE RING SUPER CHRISTMAS GIFT. SET WITH GENUINE FLAWLESS LAB CREATED DIAMONDS! 18 K GOLD ON GERMAN SILVER SET. SUPERB SET FOR THE PARTY SEASON! 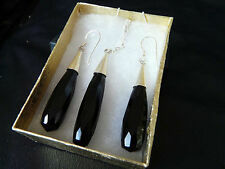 This set is made with black and white roundelle pearls. The black pearls have almost a navy blue to them. It is linked rosary style on gold plated 925 sterling silver wire. They are on shepherd hooks. VALENTINES PRICE CRASH £12.99 FROM £15.99. SET COMPRISING OF NECKLACE MATCHING BRACELET. EARRINGS AND FREE SIZE RING. SET WITH GENUINE FLAWLESS LAB CREATED DIAMONDS! 18 K GOLD ON GERMAN SILVER SET. Handmade Bracelet and Earring Set. This bracelet and earring set are made using Faceted Peach Aventurine Rounds. Beautiful Jewellery At Exceptional Prices. Gem Colour: Green. Main Gem Shape: Oval. Gold plated 925 sterling silver. Total Gem Weight Clasp Type. VALENTINES PRICE CRASH £12.99 FROM £15.99. 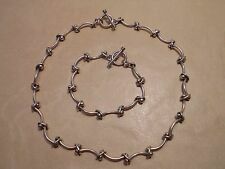 SET COMPRISING OF NECKLACE MATCHING BRACELET. EARRINGS AND FREE SIZE RING. SET WITH GENUINE FLAWLESS LAB CREATED DIAMONDS! SUPERB SET FOR THE PARTY SEASON! Sparkling, hand aggregated zirconia stones in AAA (best quality), like real diamonds. Luxury jewellery set Necklace blue. 750 white gold / Gold Plated 18K. Material: Brass, 750 gold / 18 K gold plated (hard gold plating), Mirror polished. And beautiful stones SAPPHIRES yellow tones. COLLAR and EARRINGS "To DAZZLE at parties". Necklace: 40 cm. AMBER light, dark and white. Earrings: 12 24 mm. 18KT GOLD. ELECTRO PLATED. Perfect item for parties. Still, jade is adored as dream stone and used as you said is to give its wearer the ability of dream hinting. Jade is not only a gem, but a rich myth. In ancient China, jade was known as "Sky stone". Color del diamante Diamante fantasía. NECKLACE, PENDANT. Necklace size. Tipo de piedra rojo rubí. Color de fantasía Rojo. Color de la piedra principal Rojo. Creación de la piedra Natural. Plating 18KT yellow gold. Mona Lisa collection. Set 5 pieces MONA LISA: earrings, necklace, ring. Couleur pierre dominante Turquoise. Ring size 56 plate 8 mm wide. 5-PIECE JEWELRY SET. Plate gold 750/1000. Couleur pierre dominante Turquoise. Design Double heart. 4-PIECE JEWELRY SET. EAN 2009160151131. Mona Lisa collection. Set 5 pieces MONA LISA: earrings, necklace, ring. Couleur pierre dominante Turquoise. Ring size 54 plate 8 mm wide. 5-PIECE JEWELRY SET. Plate gold 750/1000. Node and crystal design. 4-PIECE JEWELRY SET. Yellow Gold Plated. Earrings Pendantes 2 cm high. Set, for Party, Wedding, Birthday, of Gold and Legitimate Stones " Certificate "
Champagne, pink, amber. your certificate. Swarovski, carved round. Gold finish. This jewelry set. This is the set It will be your best accomplice to seduce. Presented in case. Below average. Suit petite build. Snakeskin Jasper, beautiful stones. The earrings, bail and chain are ALL gold plated sterling silver. THERE'S A LOT OF IT ON HERE. This a beautiful vintage braided set of gold plated jewellery. I don't know much about it except it's 22kt plated, it's coloured silver, bronze and yellow however and would make a lovely gift. It will be sent tracked. Designer Elanza -AAA simulated diamond Crystal (Rnd) Solitaire Ring, Pendant and Stud Earrings (with Lever backs ) yellow gold on Sterling Silver. i cant afford to start them off any lower as the lowest price shown is my cut off point as im not making profit at this price. It is tarnish-resistant and safe for most people with sensitive skin who can not wear solid gold jewellery. W e also have bracelet to match it, or have narrow necklace at 10mm, not 12mm of this one. Swan necklace, earrings jewelry set. 18K gold-plated, Crystals in top quality, made in quality jewelry. Hauptstein Swarovski Zirkonia. Nickel and Lead free. Material: Brass, 750 gold / 18 K gold plated (hard gold plating), Mirror polished. 1 jewellery set consisting of 1 ring, 1 pair of earrings and 1 chain with pendant. the ring is adjustable size. Hauptsteinfarbe Rot. EAN Nicht zutreffend. Marke Markenlos. 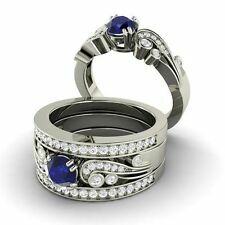 Main Stone Blue Sapphire. Type Pendant & Earrings. Style Heart. Main Stone Shape Heart. Main Stone Color Blue. Source Level. Country/Region of Manufacture India. If the information does not match, your order may be canceled. Clarity VVS1. Main Stone Creation Simulated. Main Stone Shape Princess. Style Necklace & Earrings. Main Stone Simulated Diamond. 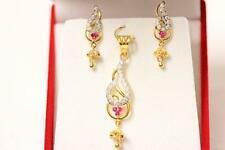 Diamond Color D. Type Jewelry Set. If the information does not match, your order may be canceled. Purple quartz natural stone. 1 jewelry set, consisting of 1 ring and 1 chain with pendant. the ring is adjustable size. EAN Nicht zutreffend. Hauptstein & Perlen Quarz. 1 jewellery set consisting of 1 ring, 1 pair of earrings and 1 chain with pendant. Hauptstein & Perlen Jade. the ring is adjustable size. EAN Nicht zutreffend.